The Syracuse Orange Men’s Basketball team has been on a roll lately. They thrilled all their fans by outlasting the Connecticut Huskies in six overtimes during last week’s Big East Tournament and was awarded a number three seed in this week’s NCAA National Championship Tournament. I see many of you are searching for information and photos of the Syracuse Orange basketball team and it’s players. With that in mind and after receiving a comment and some encouragement by a fellow Orange fan, I have created a special print to commemorate the first ever (as far as I know) Orange Out! 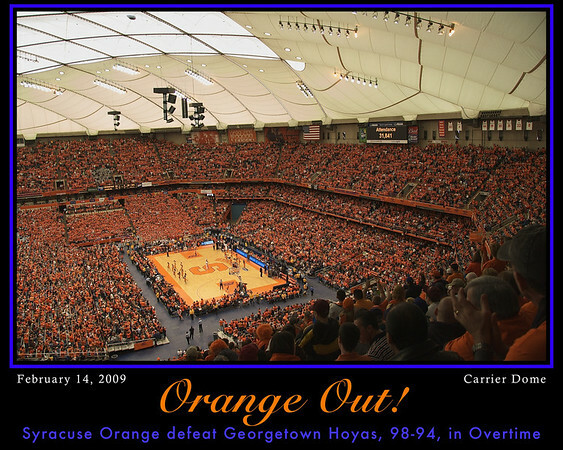 at the Carrier Dome from last February in a Big East game against the Georgetown Hoyas. Own a piece of Syracuse Orange Basketball history! GO ORANGE! Orange Out! Click Photo for More Information and to Place an Order. Prints are 16 by 20 inches in size and comes in Lustre ($19.99) and Metallic ($29.99) professional finishes. This entry was posted in Sports and tagged basketball, big east, carrier dome, georgetown, hoyas, new york, orange, out, print, syracuse, syracuse university. Bookmark the permalink. 1 Response to Let’s Go Orange! Wow! Talk about all out support!